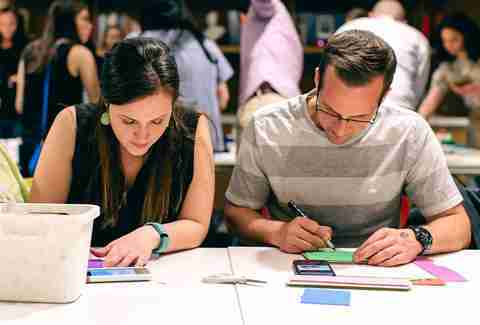 What to know before you go: If you enjoy a slightly lavish lifestyle as well, get your ticket for MFA First Fridays. Every first Friday of the month from 6pm - 9:30pm, enjoy music, cocktail, tapas and of course, art. Get your tickets for the next MFA First Fridays event before they’re sold out, coming in at $25 per ticket. Regular museum hours are Tuesday, Saturday and Sunday from 10am-5pm, or Wednesday, Thursday, Friday from 10am-10pm. Admission is $25 unless you have a Bank of America card. The “Museums on Us” program applies for the MFA, so bring your card for free admission on the first full weekend of the month! 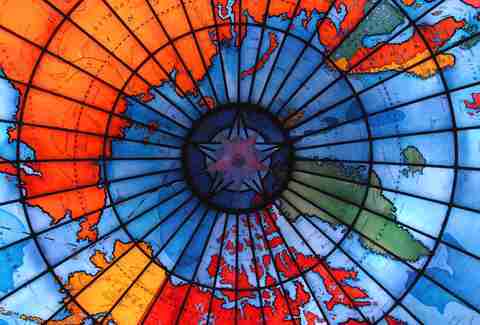 The Mapparium is a three-story, stained glass globe found inside of the Mary Baker Eddy Library -- one of the research library’s main attractions. In 1935, Boston architect Chester Lindsay Churchill designed the globe to symbolize the international outreach of The Christian Science Monitor founded by Mary Baker Eddy in 1908. To this day, the globe reflects a 3-D representation of how the world was in 1935, taking you across a 30-foot long bridge through its interior. The Mapparium now incorporates special effects including a light and audio show and computer-controlled lighting to highlight the different regions. What to know before you go: The exhibit is open Tuesday through Sunday 10am-4pm with tours running every 20 minutes. Have you ever wished you were born in a different decade? How about a different century? 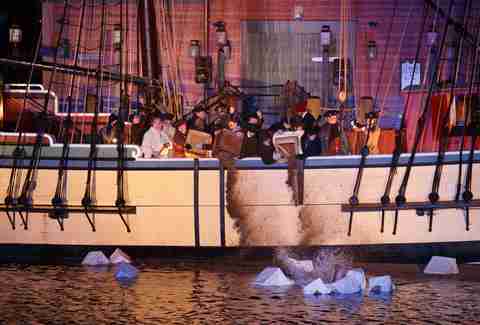 Now’s your chance to experience an integral part of American history, dating all the way back to 1773. At the Boston Tea Party Ships & Museum, you’ll walk across authentically restored ships and launch a couple cases of tea off the deck and into the sea during your guided tour. BYO old-timey hat! You’ll also get a look at the museum’s holographic displays and immersive film, “Let It Begin Here.” The award-winning documentary, depicting events leading up to the American Revolution, captures the sights, sounds and even feel of all the action. Don’t forget to stop and score some tea at Abigail’s Tea Room & Terrace, or if you’re looking for something stronger, beer from the nearby Harpoon Brewery is always an option. What to know before you go: It's open Monday through Friday 10am-4pm and tickets are priced at $29.95 per person. For a wild night, every second and fourth Friday of every month, the museum hosts Tavern Nights, inviting guests to join in on authentic games, songs and dancing -- get your colonial, low platform shoes ready. Located on a narrow, winding street in the North End, the Paul Revere House is the oldest remaining structure in downtown Boston (built around 1680, but restored of course). Obviously, the house is known for its famous occupant Paul Revere, who led the revolutionary charge by yelling, “The British are coming!” (Turns out that was a minor fabrication, but we digress.) The house is filled with artifacts including the Revere family’s actual furniture and silver. Tours are self-guided (if you have trouble paying attention), but staff members are on-site to answer any questions. In honor of the 110th anniversary of the Paul Revere House opening as a museum, stop by April 18 or April 19 for Postals for Your Collection. A drop-in station will display examples of vintage postcards sent by tourists in the 19th and 20th centuries. You’ll even get a chance to mock one up of your own with a neat quill pen. What to know before you go: Hours are Monday through Friday 9:30am-5:15pm (closes at 4:15pm November 1-April 14). Admission will cost you $5. Surrounded by the Financial District’s towering buildings still stands one of the US’s oldest public buildings. The Old State House, built in 1713, has been preserved to welcome tourists and commuters alike (State Street station, part of the orange and blue line, is in the sub-basement of the building). You’ll find the museum on the upper level, offering thousands of artifacts and a wide-selection of historical documents from The Boston Society’s collection. Daily tours are held at The Old State House, with none other than your favorite colonial characters leading the way and telling stories of the Boston Massacre, which happened right outside of the building. What to know before you go: The museum is open Monday through Friday from 9am-5pm and charges $10 for admission. 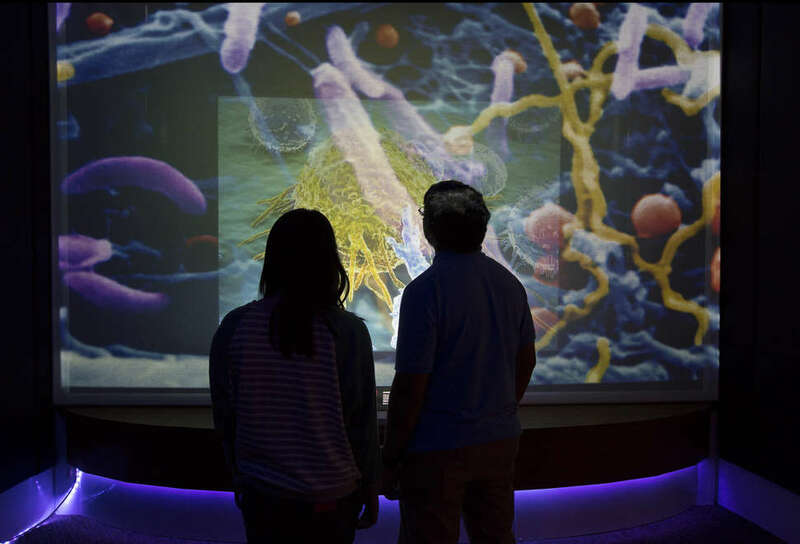 The Museum of Science’s ever-changing educational opportunities touch on a number of topics including the temporary exhibit Defeating Disease and the upcoming Crocs: Ancient Predators in a Modern World. Permanent fixtures of the museum cover electricity, math, rocks, space, engineering, and animals, with a live care animal center on the lower level. The sensory experiences at the museum are unmatched, from the 4-D theater to the state-of-the-art Charles Hayden Planetarium. On May 4, The Coldplay Experience will be held at the planetarium and will fuse the band's music with trippy visuals -- which sounds downright awesome. What to know before you go: Hours are 9am-5pm Saturday to Thursday and Friday 9am-9pm. To get into the exhibit hall, tickets are about $25, with added costs if you’re planning on checking out the theaters and planetarium. Take one look at the Institute of Contemporary Art Boston and you’re already staring art right in its face. The building, designed by architectural firm Diller Scofidio + Renfro, sits surrounded by the Boston waterfront and captures the revitalization and modern feel of the Seaport area. 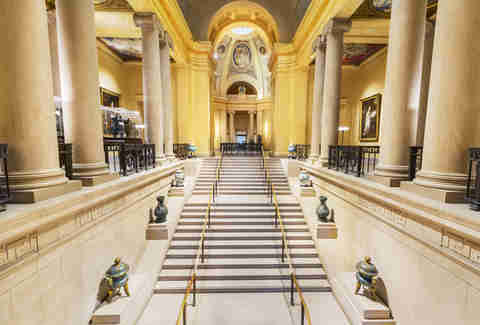 Once you’ve finished posing on the grand staircase overlooking the ocean, step inside the most expansive and open exhibition space in the city. Check out the Art in the Age of the Internet, 1989 to Today exhibit open now until May 20 for a collection of paintings, photographs, sculptures, video, and more sharing the effect of the Internet on art and contemporary culture. Coming in early May, New York-based artist Kevin Beasley will present his first exhibition in Boston, combining clothing and sound through his selected sculptures made over the past five years. Also coming in May, New York-based artist Caitlin Keogh's first solo museum presentation, featuring her large-scale canvases exploring gender and femininity. In the past, the museum has housed works from Picasso, Andy Warhol, Jackson Pollock, and Steve McQueen. What to know before you go: Hours are Tuesday, Wednesday, Saturday, Sunday 10am-5pm and Thursday, Friday from 10am-9pm. General admission will cost you $15 except on the ICA’s “Free Thursday Nights” from 5pm-9pm. This summer, head to the ICA’s highly anticipated “The Watershed,” a former copper pipe shop turned space for the museum’s additional visual arts, open and accessible to all with free admission. Tucked away in the basement of the Somerville Theatre, you’ll find the Museum of Bad Art. The work may not get much love from traditional institutions, but the MoBA knows how to celebrate each one -- collecting and exhibiting artwork just the way it comes. 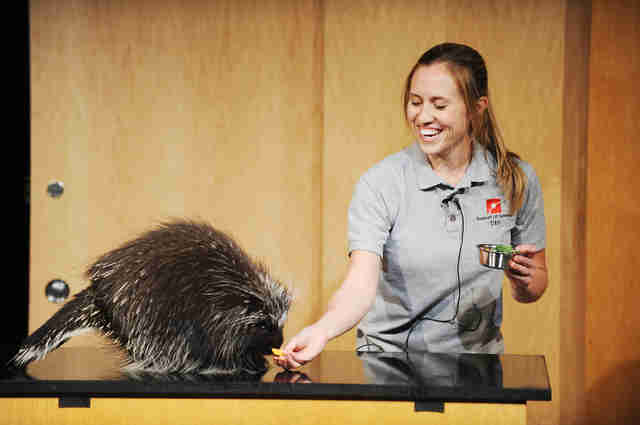 It puts up a new exhibit typically two or three times a year; the current exhibit, “MoBA Zoo,” displays all kinds of animals accompanied by commentary, like in the painting Chicken in the Kitchen. The MOBA shows about 20 pieces at a time, but has over 700 pieces stored in its permanent collection. 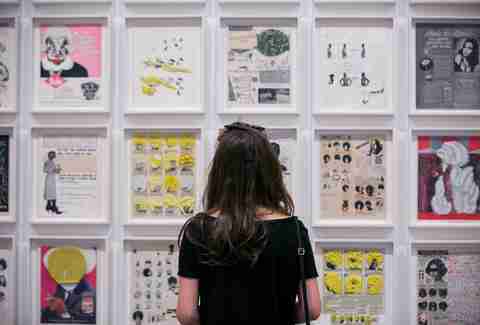 What to know before you go: Admission is always free -- simply request a museum pass from info@museumofbadart.org, or if you’re planning on catching a movie at the theater, head on down afterwards. Whenever there's a movie showing, the museum should be open! Typical hours run Monday through Friday, 4pm-9pm and Saturday/Sunday, 2pm-10pm. In 1903, art collector and philanthropist Isabella Stewart Gardner opened a museum inspired by Venice’s Palazzo Barbaro, incorporating columns, windows, doorways, and statues gathered from Italy. Throughout her life, she accumulated and displayed a collection of more than 7,500 paintings, sculptures, furniture, textiles, etc. from around the world. The museum houses not only a mixture of ancient artifacts and artwork, but also “The New Wing,” a modern exhibition space and performance hall cultivating new talent. As part of this initiative, the museum hosts “Third Thursdays,” featuring live music, performance and dance. You can catch the next one April 19 for MUSIC: Motivating Us to Share Intercultural Connections. The most recognizable section of the museum lies in the famous courtyard, featuring hundreds of flowers and lively landscaping, which can be seen from almost every gallery in the institution. What to know before you go: You can check the museum out Wednesday, Friday, Saturday, Sunday 11am-5pm and Thursday 11am-9pm. Tickets costs $15 unless your name happens to be Isabella in which case you have lifetime free admission! If your name isn’t Isabella, but you’re still looking to save, Bank of America’s “Museums on Us” program allows all visitors with an active Bank of America card to attend for free on the first full weekend of each month. With more than one million objects, prints, rare books, drawings, photographs, films, and holograms, MIT Museum’s collection of research just keeps growing. The institution explores a range of topics, with current exhibitions centered on artificial intelligence and gestural engineering (basically, intricate metal sculptures that move in cycles). Coming fall 2019, The Polaroid Project: At the intersection of Art and Technology will showcase photographs by 120 artists including Ansel Adams, Andy Warhol, Walker Evans, and Barbara Crane. And if you can’t wait until then, there’s a Polaroid exhibit happening right now, Polaroid’s Invention of Instant Photography. Also be sure to check out the Cambridge Science Festival from April 13-April 22 for a week filled with hands-on activities, workshops and tours sure to get your tech senses tingling. What to know before you go: The museum is open Monday through Friday 10am-5pm (open until 6pm July through August) for $10 a ticket. For free admission, visit the last Sunday of the month from September through June. In 1913, the Boston Children’s Museum was founded by a group of teachers in Boston’s Jamaica Plain neighborhood. Fast forward over 100 years later, and now it’s one of the largest children’s museums in the world. 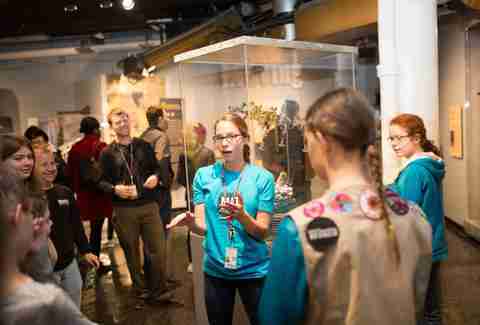 With a prime location and waterfront view, the Boston Children’s Museum helps kids (and adults tagging along) explore health and wellness, literacy, the performing arts, science, technology, math and visual arts programs. As part of the many exhibits, kids have the chance to learn the laws of motion in the John Hancock Science Playground, come face to face with a life-size animatronic dinosaur and '90s kids, get ready, an Arthur and Friends exhibit to help little ones with reading. What to know before you go: The museum is open Monday through Sunday 10am-5pm (Friday’s close at 9pm). Tickets are $17.